Don’t ruin a great suit by making rookie mistakes. There are some simple rules for wearing suits that you should always adhere to – trust us, they won’t let you down. 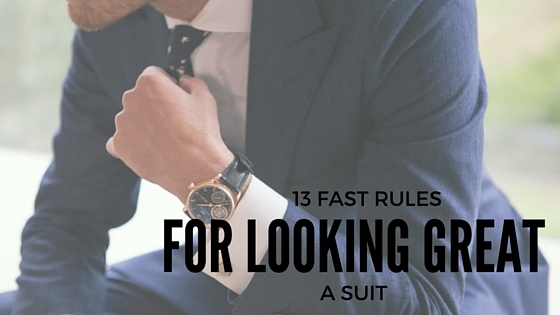 These 13 fast rules for looking great in a suit are easy to remember and will help you achieve an effortlessly stylish look when wearing a suit. 1. Check your balance. The width of your tie and lapel should match – otherwise it will look messy and pieced together without thought. 2. Food for thought – the width of your lapel can also change your whole look – thin lapels are more modern, while thicker lapels have an older feel to the style. 3. Two button suit jackets are great as they complement most shapes and sizes. With three button suits you should really leave the last button undone anyway. 4. Always unbutton your suit jacket when you sit down, otherwise you ruin the whole look. 5. A classic Windsor knot in your tie will look great with any suit type. 6. Avoid gaps between your shirt collar and your jacket lapel – it’s the most noticeable sign of an ill-fitting suit. 7. Trousers should sit on your waist, not your hips. Suit trousers are not trendy low slung jeans. 8. Waistcoats, if you’re wearing one, should be fitted so that they taper in to your waist, not hang by your sides. This will make your torso look leaner and trim too. 9. Your sleeve cuffs should be exposed by ½ inch. If they don’t, consider a shorter length jacket, although bear in mind with movement your sleeves will creep up. 10. Italian suits tend to be softer and have less structure so are perfect for informal occasions. English tailoring has more shape and more defined shoulders so it’s perfect for creating a sleek silhouette and for more formal occasions. 11. Add personality to your suit with a pocket square or a subtle tie clip – but don’t go overboard and do everything. 12. A classic watch (most definitely NOT a sports watch) will complete your look without overshadowing it. 13. A good pair of dress shoes like classic black Oxfords will always look the part when teamed with a good suit. Polish them to a shine for maximum impact.